When Dare to Dance was first created, the program promised to “start a movement.” Now in their fourth year of full production, they’ve done that and more. Founded and directed by Zheng Wang, Dare to Dance is a professional-quality showcase for emerging dancers and choreographers. Its goal is to eliminate the barrier between audience and artist by creating relationships in the dance community. Over the years, this inspiring environment has developed innovative, inclusive dance performances, and the most recent installment opens this weekend. Dare to Dance 4: It’s Time plays at Broadway Performance Hall this Friday and Saturday (April 25-26) at 7:30 PM. Zheng Wang started Dare to Dance in 2010, when he dared himself and his friends in the flash mob community to put together an original dance showcase of their own choreography. “I think the show surprised a lot of people, including ourselves,” remarked Wang. “It’s amazing what can happen when you can get a group of creative, enthusiastic people together.” The first ever Dare to Dance production sold out the Erickson Theatre, and created the momentum for further creativity. Dare to Dance 4: It’s Time presents a wide array of premiering choreographers and dance productions. 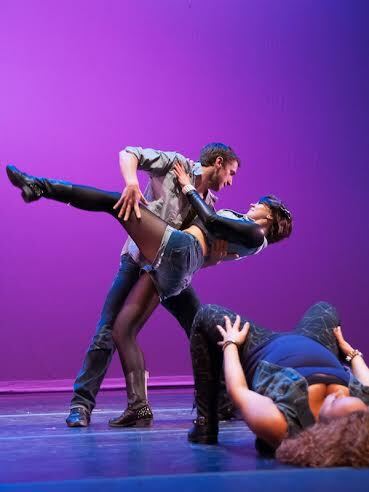 Ranging from hip hop, to salsa, to musical theatre, the show is sure to entertain. Dare to Dance 3 alumni Impulse Artistry returns with their signature upbeat hip hop style in a 90’s tribute mix choreographed by Alaina Dale. Diadra Smith of Impulse Artistry has also created a somber and powerful contemporary piece. Local hit band, Fly Moon Royalty provides the soundtrack for another hip hop piece, and Dare to Dance favorite The Candy Ladies will present a new burlesque work. Local ballroom professionals, Sara Gordon and Anton Lukyanov, have created two original fusion pieces that mix salsa with contemporary, hip hop, and even ballet to entertain audiences with intense partnerwork. Broadway-style choreographer Stephen Lloyd will present a Marilyn Monroe themed musical theater piece with live vocals. From contemporary to dub-step, It’s Time promises a vibrant, diverse production created by local dance enthusiasts, for local dance enthusiasts. “It’s about creating,” says Wang. “There is magic in so many people using their creativity.” Wang wants the audience to feel a connection with each piece, and with the art of dance as a whole, and ultimately to walk away inspired. “If the show inspires them to dance, great. If it inspires them to be creative, to venture out, to build something out of passion….that’s even better.” Dare to Dance 4: It’s Time takes Broadway Performance Hall by storm this weekend. Tickets are available here. Quirky Delights on Parade at ‘Mo-Wave!